Screen grabPurported members of Mexico’s Jalisco New Generation cartel. The Jalisco New Generational cartel has risen to the top of Mexico’s criminal hierarchy. The group made its mark in 2015, when it brought down an army helicopter in western Mexico, killing six soldiers. But pressure on the group is mounting, and Mexico says it caught some of the gunmen responsible for downing the helicopter. Mexican authorities on Wednesday said federal police apprehended 14 suspected members of the Jalisco New Generation Cartel, the relatively new group that has quickly risen to the top of Mexico’s criminal underworld. Among the suspects, caught as part of Operation Titan Shield in the states of Jalisco and Quintana Roo, were six who are believed to have helped shoot down a Mexican army helicopter in western Jalisco in May 2015, killing six soldiers. The arrests were made on a ranch east of where the helicopter was shot down with an RPG, and the suspects, all men between the ages of 25 and 50, were caught without a shot fired. Police seized eight rifles, one of which was Barrett .50 calibre, as well as an M60 machine gun, 35 magazines, and more than 1,000 bullets. Two stolen cars were also recovered, both of which were modified to mount an M60. The Jalisco New Generation cartel, or CJNG, emerged around 2010, formed by members of the powerful Sinaloa cartel. Led by former policeman Nemsio Oseguera Cervantes, aka “El Mencho,” the group quickly grew, spreading across Mexico. “This means the Jalisco New Generation Cartel is a powerful organisation with the money to acquire powerful weapons, form small armies, and train their people in the use of these weapons,” Guillermo Valdes, a former Mexican intelligence chief,told The Wall Street Journal at the time. The six soldiers were among 15 people killed in Jalisco that day, when CJNG gunmen used burning vehicles to block roads, torched banks and gas stations, and attacked security forces – an offensive that came in response to a law-enforcement operation against the group. The attacks brought new scrutiny to the CJNG, but it has only expanded since then, often muscling in on territory controlled by weakened rivals and frequently coercing or corrupting law enforcement. Homicides in Mexico have only risen since 2015, with 2017 being deadliest year on record. While not all the violence is caused by the CJNG, Mexican authorities have intensified their focus on the group. “Right now the Mexican government is putting forth more resources [and] more efforts against the Jalisco New Generation Cartel than they are on the Sinaloa cartel [or] than they are other criminal groups, simply because of the high-intensity violence” generated by the CJNG, Vigil said. At the end of May, Mexican marines arrested Oseguera’s wife in Guadalajara, the Jalisco state capital and a money-laundering hub. She is believed to have helped manage the group’s finances, and her capture came after a series of arrests of suspected CJNG financial operatives. At the end of July, Mexican investigators said they had detained two suspected CJNG members, one of whom was linked to the disappearance of three Italian men in Jalisco in January. That disappearance led to “more pressure brought to bear by Italy,” Vigil said. 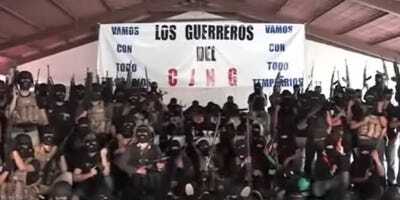 The CJNG has also been challenged by a new rival in its Guadalajara stronghold. The new group, called the Nueva Plaza cartel, is believed to be led by a one-time confidant of Oseguera. Some have suggested other CJNG rivals, namely the Sinaloa cartel, are backing the new group. President Enrique Peña Nieto, whose term ends on December 1, “wants to have a significant impact” on the cartel before he leaves office, Vigil said.